Penthouse, Greenhouse, East, West Terrace & Apat. Urban adventure, daredevil design, and energetic social hub, Hudson takes convention and turns it on its head. 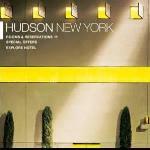 The next generation of hotel, Hudson is stylish, democratic, young at heart and utterly cool. Born from the innovative vision of design impresario Philippe Starck, this luxury New York boutique hotel is exuberantly energetic, breathtakingly beautiful and architecturally unpredictable. Best places to hang: Hudson Common, a modern-day beer hall and burger joint with nightly entertainment; Sky Terrace (open seasonally), an English garden in the skies of New York City, for a quiet drink and an epic view; Hudson Lodge (open seasonally), New York's first urban ski-resort themed bar filled with authentic taxidermy, faux-fur throws and sheep-skin pillows. Located in midtown, just steps from Central Park, Columbus Circle Carnegie Hall, Lincoln Center, Time Warner Center and the theater district.